The Apathy is a compact, simple-to-use console. It allows the user to command all 512 DMX channels at the same time, and to step through individual channels using the Apathy function button. 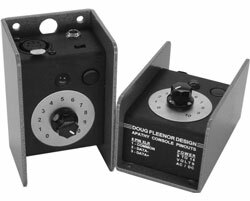 The original Apathy controlled all 512 DMX levels with its single control knob. However this was too simplistic for some users so Doug Fleenor Design added the industry’s most hostile user interface to create the Apathy Minus. Now, through a complex timed sequence of button presses, any single DMX channel can be assigned to the knob. Once selected, channels may be easily incremented or decremented. Available connector types: 5 pin XLR, 3 pin XLR, or RJ-45 (ESTA or Color Kinetics pinout).